Lili Rachel Smith felt invisible. Born with a condition known as Apert’s syndrome — which causes abnormalities of the skull, hands and feet — her peers in middle school excluded her from social activities. The isolation was so severe, in fact, that Smith would often eat alone in the girls’ bathroom, hiding from others, hoping that her mom would pick her up early from school. In 2009, Smith sadly passed away from medical complications at the age of 15. But she became an inspiration for many. At her memorial service, Smith’s former classmates learned the depths of her pain and asked her mom, Laura Talmus, about doing something proactive to honor Smith’s memory. On that day, Beyond Differences was born: “It’s a social justice movement led by teens for teens to ensure that everyone feels valued, included, respected and accepted,” Talmus tells Giving Compass. 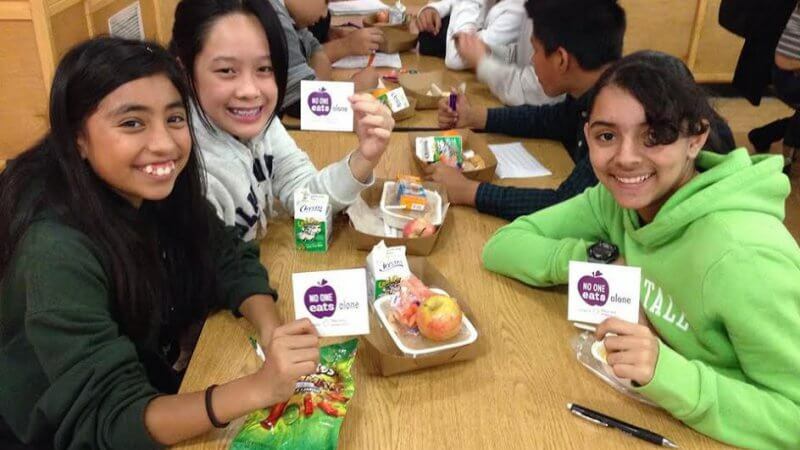 The program — which has reached students in more than 4,000 schools across the country — has created several national awareness initiatives, including No One Eats Alone Day on Feb. 9. To know the importance of a program like Beyond Differences, Talmus reminds us that social isolation is often a precursor to bullying, which has run rampant in recent years. The consequences for young adults include increases in cases of depression, anxiety, high blood pressure, and weight problems, according to the research study Social Isolation and Mortality: A Comparable Predictor to Mortality as Traditional Clinical Risk Factors in the American Journal of Public Health (2013; Matt Pantell, MD). In California, bullying cost schools $276 million annually; $77.9 million of that overall number is tied to bullying based on race or ethnicity, $62.7 million for sexual orientation, $54.5 million each for gender and religion and $49 million for disabilities, according to a study published in Psychology Today last June. While many organizations focus on strategies for reacting to bullying after it happens, Beyond Differences works to prevent bullying before it starts by teaching students to become activists and change the culture of middle school. Sophia Salesky has felt Beyond Differences’ impact firsthand. In middle school, the Northern California native felt isolated from classmates simply for being her own unique self: passionate about acting, enthusiastic about everything. “Growing up, other people thought I was being childish and they thought I was weird, so they would exclude me from things,” she says. Her older sister, Abigail, became involved in Beyond Differences at an early stage, and the program helped Sophia cope. Now a high school senior, the younger Salesky is a teen board member with the program, helping local middle schools lead their own version of No One Eats Alone Day, disseminating materials and supporting young people taking charge of the event: Beyond Differences gives out backpacks filled with activity suggestions, prompts, and games, but the variations are up to each individual school, so they can customize based on class sizes and needs. Salesky met two new girls when the initiative enacted at her middle school years ago — and they are all still friends to this day. She hopes that others will have similar experiences. But the goal is the same: social isolation takes a break. At least for one day. Look out for social isolation warning signs. If your child or someone you know is having a hard time in school, don’t stay silent. Seek to learn more about what’s going on and be proactive in terms of support, whether it’s a personalized approach or through an organization like Beyond Differences. Spread the word. No One Eats Alone Day is Friday, but it’s still not too late to participate. The materials you need to get things started in your community are available online for immediate download and free to use. If you feel like you missed the boat, Call It Out Day — which encourages a kinder digital dialogue among teens — is coming up on April 27. If you are looking for more articles and resources for Inspiring Stories, take a look at these Giving Compass selections related to impact giving and Inspiring Stories. Big philanthropic bets have the power to change society for the better. In fact, the majority of the most successful nonprofit organizations and social movements over the past decades have had at least one $10M or greater philanthropic gift behind them. While supporting ambitious social change is the primary motivation for the large majority of philanthropists, 80-percent of their big bets go to traditional institutional giving such as universities and medical research. Why does this aspiration gap exist, and what can be done to close it? Inspiring Stories is a fascinating topic, and others found these events, galas, conferences and volunteering opportunities aggregated by Giving Compass to be relevant for individuals with a passion for Inspiring Stories.